There’s no getting around it; buying a new kitchen is expensive. Investing in a new kitchen when ours starts to look a bit tired, is a luxury that many of us can’t afford. For those of us faced with a kitchen we’re not that keen on when we buy a house, it can be tempting to rip the kitchen out and start from scratch. Before you do anything, think about whether you could save money (and time) by making some simple and inexpensive changes. Here are some things that you can do to makeover your kitchen without breaking the bank. Changing the look of your cupboards and drawer fronts is easily one of the most cheap and effective changes you can make in any kitchen. For those of us with melamine cupboard doors, painting those shiny fronts seems like it may be an impossible task (or one that involves way too much messy sanding). But fear not. There’s a product that you can use that is quick and easy to apply and eliminates the need for sanding. You can also use it on varnished or painted wood cupboards to avoid the need for sanding in that case too. ESP Easy Surface Prep bonds paint and varnish to all shiny and smooth surfaces, by forming a film on the surface of your cupboards, for paint to adhere to. As it’s odorless, you don’t need to worry about nasty chemical smells putting you off your cornflakes for the next 6 months. Even better, because it’s quick drying, you can paint over it with your choice of finish after just 2 hours! Painting a wall with blackboard paint to turn it into a fully functioning chalkboard, not only looks great but also gives you somewhere to write your shopping list. Pick up some colored chalk and it’ll also serve to keep the kids amused while you’re busy cooking. Wall units can make kitchens feel smaller and more enclosed. Taking some (or all) of them down and then building some shelves, can help to make your kitchen feel more modern and spacious. Display your crockery and glasses or if you want, use large glass jars (inexpensive jars are available in most supermarkets) to store ingredients such as pasta, rice and flour. Much more pleasant-looking than plastic packaging and easier to get into! Adding a dining table to your kitchen can do wonders, by helping to make your kitchen feel lived in and inviting. If you don’t have the space for a table, consider investing in a small island. Add some stools and you’ll have somewhere to eat your breakfast on a morning. A larger kitchen island can serve as somewhere to eat, somewhere to sit and chop and another storage space to keep your surfaces clutter free. Have the wrong lighting and your kitchen can feel dull and tired. Invest in new lighting and you could help make a real difference to the feel of your kitchen and make it a more light and practical space in the process! Many people opt for spotlights in a kitchen because they are an effective way to light a room without having to worry about the best places to hang overhead lights. Consider swapping them out for metallic ceiling lights for an industrial edge (painted metal adds a great ‘pop’ of colour to help revive your space) or chandeliers for a touch of glamour. Obviously, all electrical work should be done by an electrician. Curtains can make a kitchen look old-fashioned. Invest in blinds in a color of your choice to help ‘lift’ your kitchen. If you don’t want to spend the money on custom-made blinds, you can get a wide range of blinds, that you can cut to fit your windows, in most furniture shops for a fraction of the cost. We’ve all moved into a house and wondered what the last owners were thinking when they installed a plastic sink. 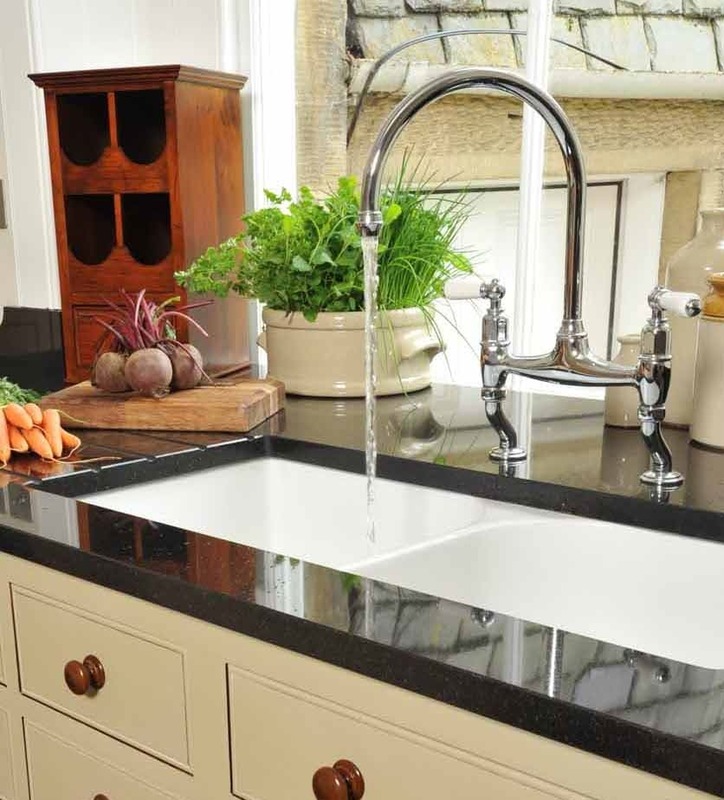 Changing your sink for a stainless steel or ceramic version can help to spruce up your kitchen and result in it feeling much more modern. 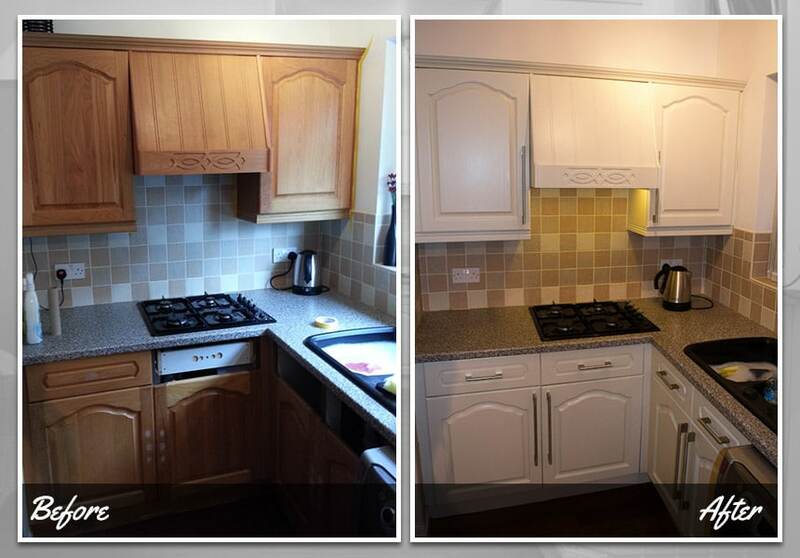 It’s amazing what a lick of paint can do to the feel of your kitchen. Tiling can be expensive and time consuming. So why not paint the tiles you already have, instead? ESP Easy Surface Prep can be used on ceramic tiles, to prime and prepare them for painting. Pick a colour palate to suit the rest of your kitchen. OK, so this one is a little more expensive but changing your surfaces can have a massive impact on how your kitchen looks and is much cheaper than buying a whole new kitchen. If you feel that your kitchen lacks charm, wood or wood-effect laminate surfaces can help to create that country-cottage feel, even if your cupboards are ultra-modern. For those who have inherited a wooden kitchen and want to make it more minimalist, you could paint the cupboards white and have granite surfaces installed (or granite-effect laminate surfaces) to bring your kitchen right up-to-date, without having to replace the whole thing. For many of us, our kitchen is the heart of the home and somewhere we spend a lot of time. This means that we want it to look its best. 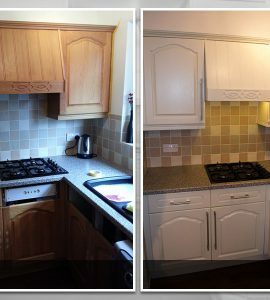 Next time you think that your kitchen has started to look a bit worn around the edges or you purchase a house with a kitchen you can’t stand, consider the difference a few simple and budget-friendly changes could make, instead of ripping the whole thing out and starting over. Have we inspired you to makeover your kitchen on a tiny budget? Send your photos to sales@owatrolusa.com – we’d love to see what you’ve done!